Has Hispanic / Latino Vote Won US Election for Hillary Clinton in Florida and Beyond? Trump started off his election campaign by denigrating latino's, and thus it looks like Trump has achieved what no democrat has achieved to such great extent which is galvanise the Latino vote in unprecedented numbers to come out and vote for the Democratic candidate and thus it will be the estimated 6.5 million Latino's in Florida who could win Hillary Clinton the state and US Presidential election of 2016. To illustrate the Latino factor at work and how they are playing a critical role in this election then the following table of the breakdown of the Latino vote over recent presidential elections illustrates the huge disadvantage that Donald Trump now stands at in terms of the critical Latino vote. What's worse for Trump then the share of the vote is the fact that a record number of Latinos are coming out to vote for Hillary in this election. For instance in the critical state of Florida, early voting is up by 87% to +453.8k on the numbers for 2012. This definitely looks likely to be the last US presidential election when white voters will be in the majority, and so Trump effectively represents a reaction against the process of America becoming a majority non white country. 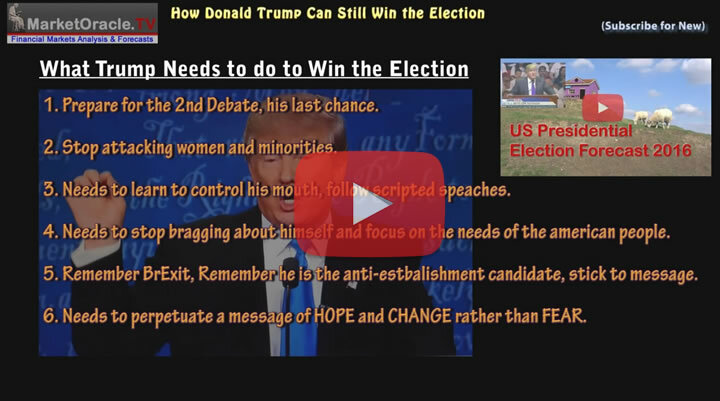 So if Hillary wins tomorrow then it will be because the Latino's have won the election for her, and for that the only person Trump has to blame is himself, which I warned of in my following video of 2nd October, that he needs to STOP attacking minorities! So as things stand tonight then it does look like that Trump has lost the US presidential election as a direct consequence of the huge surge in the Latino vote. In terms of the polls, Hillary continues to benefit from the FBI's abrupt u-turn, with Hillary Clinton further pulling away by today standing on +2.9%, against +1.8% yesterday and +1.7% the day before. The surge in Hillary's FBI political intervention induced polls lead is reflected across the opinion polls based forecasters such as Nate Silvers site which now forecasts a 71% probability for Hillary winning the election up from 67% yesterday, against Trump trailing on 29%. https://www.predictit.org (4th Nov 2016) - Clinton 71c, Trump 34c ($1 winner). As for the betting markets, well after crashing yesterday to 6 again from a peak of 3.45 just a few days ago are currently trading better at 5.4. What this means is if one placed a £100 bet on Trump today then if he won that would result in a profit of £440 (+stake). Whilst a £100 bet on Hillary would yield a profit of just £22 if she won, which illustrates that the betting markets are strongly discounting a Hillary Clinton win, which if does not happen would represent a huge shock result. However the national polls don't accurately represent the real election battle which is taking place amongst some 9 BrExit swing states totaling 108 electoral college votes. Presently, based on a minimum 4% polls advantage the electoral college map breaks down into a tally for Hillary Clinton of 239 votes thus requiring just 31 to win, whilst Donald Trump based on the state polls has 191 electoral votes in the bag though still requiring a sizeable 79 to win. However, what the pollsters are missing is what I termed as the 'BrExit Factor' that allows for a 3-4% swing AGAINST the opinion polls in the actual election result as a consequence of Donald Trump being America's first anti-establishment candidate in perhaps the past 40 years who I expect to capitalise on the BrExit factor that shocked the British establishment back in June 2016 due to the fact that the pollsters, political pundits and the betting markets all got that result very badly wrong. So instead of REMAIN winning by 4% as had been the expectation right into the close of the polls, REMAIN actually LOST by 4%! THE BREXIT FACTOR, one of the British people raging against the establishment elite, the bankster crime syndicate and giving them a very bloody nose and so is the case for THIS US Presidential election when Americans have an opportunity to give americas banking crime syndicate that owns most politicians a bloody nose. Therefore whilst a 3-4% Brexit swing is unlikely to make much difference to those states standing on a 4% or greater poll lead for Hillary Clinton. Nevertheless implies that the 9 swing state listed are BrExit swing states that could go for Trump including the important state of Florida which TRUMP HAS to win to win the election. So when one factors in the BrExit factor then despite the surge in the Latino vote to well beyond that of the last election, then this election is still not quite over yet and Trump could still win, albeit the last 48 hours have definitely NOT been good for Trump that has seen Hillary's national and state polls lead move by +1.2% in her favour! A huge and potentially election changing last minute move largely as a consequence of the FBI's political intervention Sunday afternoon that feeds into Donald Trumps narrative of the election being rigged.